I have managed to work out how every else links straight to the blog with all the rest of the pics on by ‘borrowing’ this pic above from Kathy’s blog and putting a link on it so here we go with my pics for August – click the above logo for everyone else’s. Most of these pics were taken in one week in Spain and luckily there were some very easy words this month for me to be able to get – hope that you like them all! 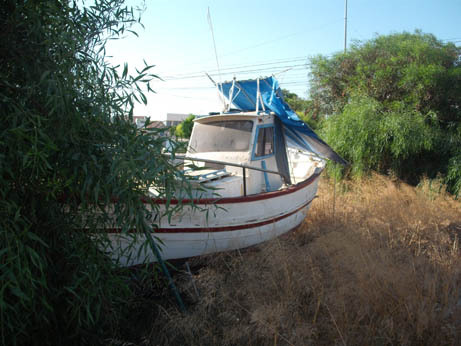 Obviously there are loads of boats in Spain in all the marinas but this poor old thing has been stuck on a plot by the local supermarket for years – I bet it dreams of better days sailing away! 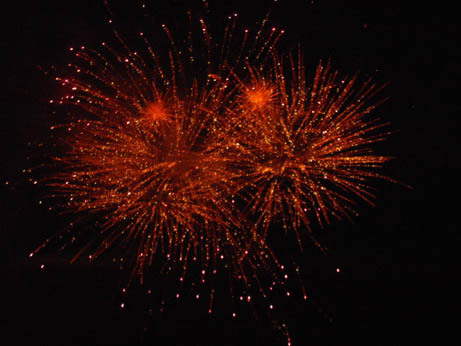 This was a very easy one to do in Spain as the local La Marina fiesta was on so here you have a pic of the fireworks at the end of the night. However we had a very festive month so here is a pic from the Tribute Band Music Festival we went to this month as well! We also visited the International Festival of Quilts which I have already posted about. The Spanish love public fountains so I was spoilt for choice for this one – however my aunt is a bit of a fan as well and I knew she had a couple in her garden so went to take some pics – turns out she now has 7! 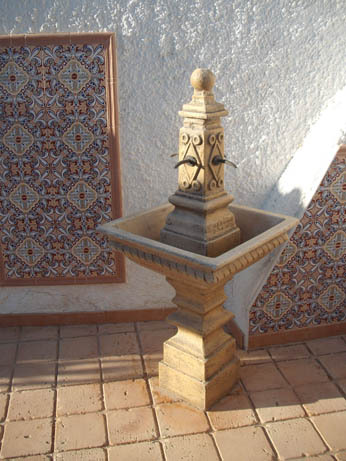 This is a Moorish style one in a corner of her back terrace. 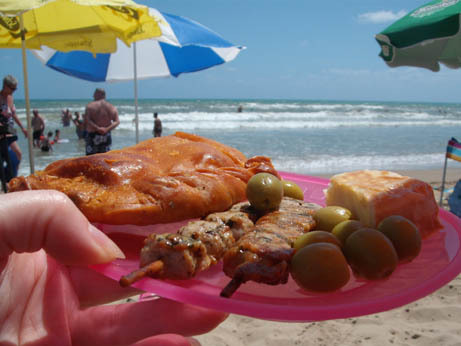 On the lovely sunny La Marina beach – a very Spanish picnic lunch of tuna empanada, chicken pinchos, olives and tortilla. One of my favourites – not that this is at all competitive! 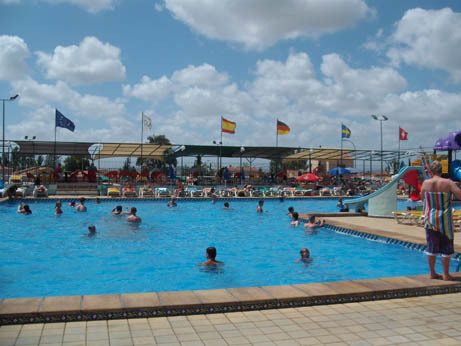 If it is too hot for mountain biking then we swim in the local pool. 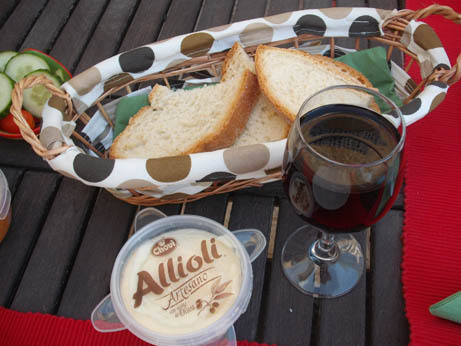 Served with allioli – garlic mayonnaise – this is one of the best things about Spain, I could live on this! Oh and red wine! 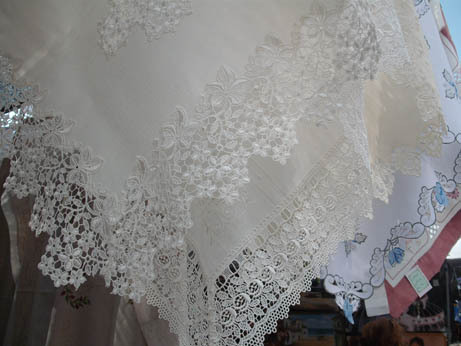 The Spanish have the most beautiful textiles, especially table linen – I have bought quite a few table cloths and runners and here are some more gorgeous ones at the local market. 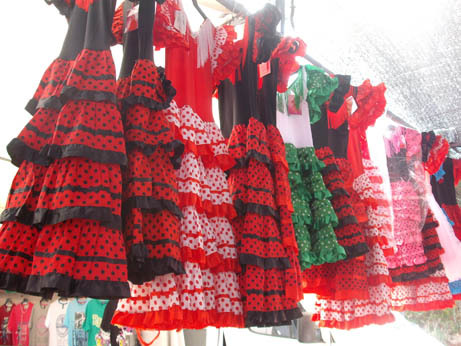 At the same market you can get your flamenco dresses (children’s size only unfortunately) with matching shoes. We had really clear skies all the way back so I was able to get some fab shots of mountains – this is the Pyrenees with added snow! 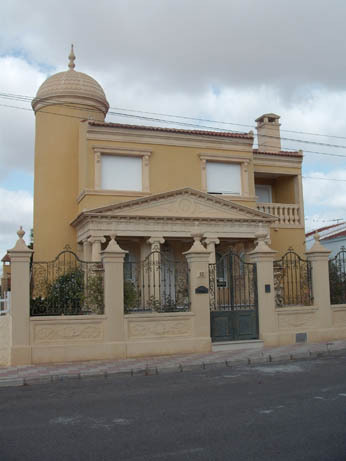 This could easily have been used for the next category of something bizarre as well – not original but a copy of ancient Roman architecture. 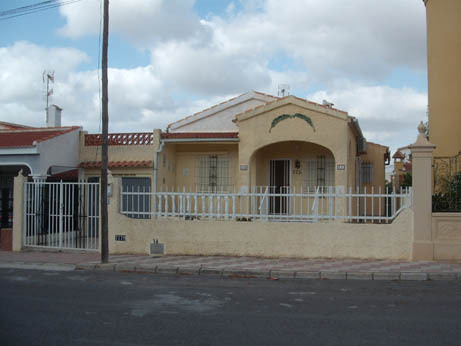 The bizarre bit is in the fact that people here re-model their houses in all sorts of styles, this is the next door neighbour showing what the house would have originally looked like when it was built. 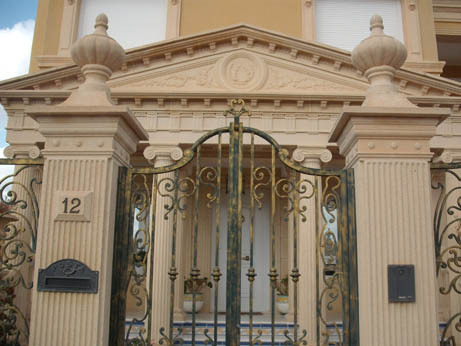 And here is a close up of the lovely gates and portico. 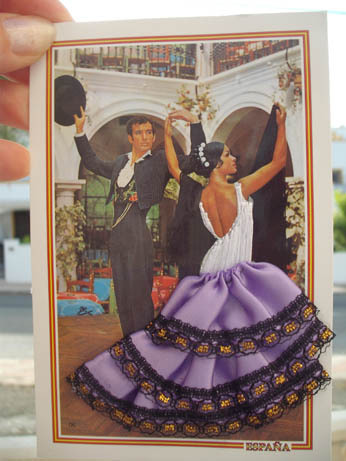 I always thought these little postcards were a bit bizarre when my grandparents used to bring them back from Spain in the 70s – I was surprised to see them still around. The skirt of the dancer is fabric sewn on to the card and her bodice is also hand stitched. 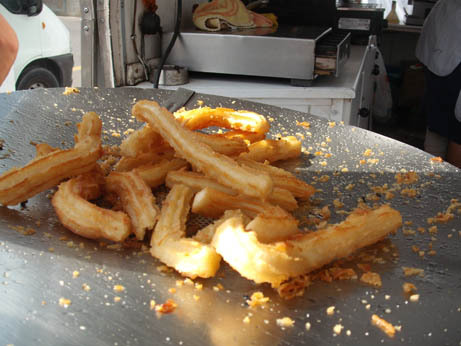 Churros from the market – a long sugary donut that the Spanish also like to dunk in thick melted chocolate! I hope you have enjoyed these pics – I can’t wait to see all the other contributions for this month. 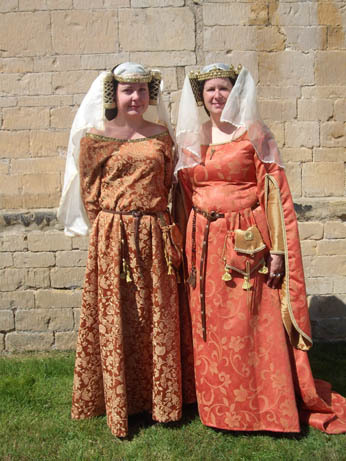 We have just got back from Bolsover Castle, our last show with my re-enactment group Order of Fighting Knights. Various members of the group are leaving due to work and other commitments so we are re-forming for next year under a new name – we will now be the Swords of Mercia. We had a fantastic last weekend – it didn’t rain much which is always a bonus for an English Bank Holiday weekend and the crowd were fabulous and there were so many wonderful comedy moments that none of us could keep a straight face.We had a very nice (if cold!) group BBQ on Sunday night and then sat around the camp fire laughing about the day. We have been members of the group for the last 10 years and they have been some of the happiest years of my life, they are such a lovely bunch of people and we will always be great friends and keep in touch with the members that have left and I am really excited to be moving on with those that are remaining to do new things. I realised that though I have posted pics of our camp and the group before I have not really posted many of the castle so went out early this morning before the public arrived to take the pics in this slide show for you. The castle is very impressive, it was built in the 1600s as an entertainment venue by Sir Charles and Sir William Cavendish and King Charles the First and his wife Henrietta Maria once visited . That is one of things that most excites me about re-enactment, I have camped in places where so many great people were and significant events took place – I am a very lucky girl! 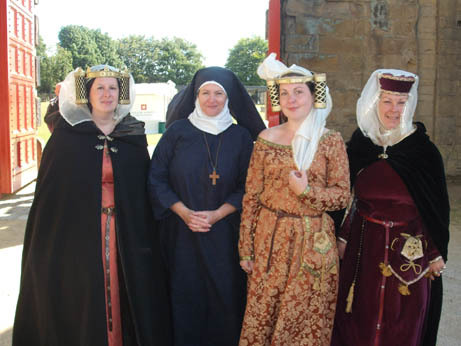 I also have a couple of nice pics of me and Ellie to show you – I had a friend take some pics with my camera as I rarely get ones of me at an event.This is Kerry, me, Ellie and Tracy in the castle grounds (as you can see it was quite windy! 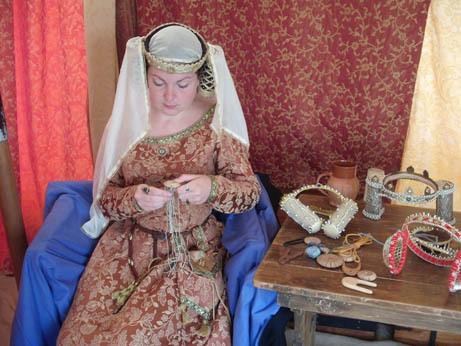 ), Kerry and Ellie in the sunshine on Sunday and Ellie in the tent during the head-dress talk today demonstrating how to make braid. I hope that you have had a very nice weekend wherever you are. I have a busy couple of weeks now preparing for another new beginning with the start of the new term but we are here for the next few weekends so I am also looking forward to getting some serious crafting done! 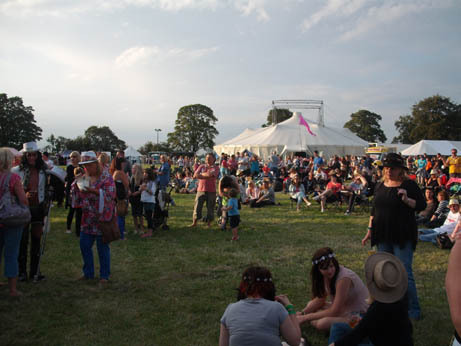 You may remember last year I did a couple of posts on the art of glamorous camping or glamping – well we have been adding to our stock of glamping gear and have just spent a lovely weekend at the Tribfest Music Festival in North Yorkshire where we had a very sunny and enjoyable weekend listening to lots of different tribute bands. My absolute faves were the Take That tribute band ‘Back for Good’ on Saturday night, I have never seen the real group but these were excellent and I very much enjoyed myself. 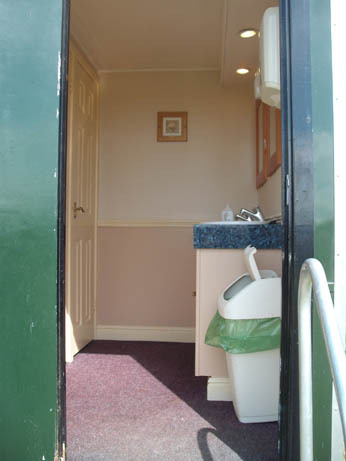 We had very good facilities again including the most glamping portaloos ever – of course they still got smelly but this is what they looked like. Sinks and mirrors and pretty pictures on the wall! And inside were real flushing toilets with wooden seats and everything! 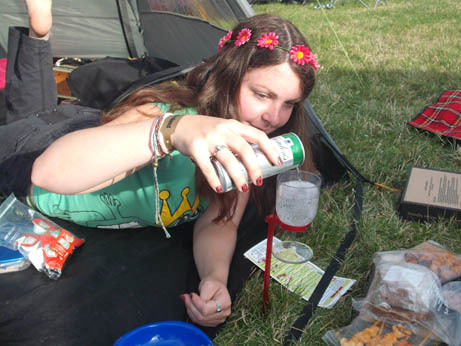 My sister bought me some new glamping accessories for my birthday – some wine glass holders that you can use in a field. You just push it into the ground and it provides a very stable holder for your tipple! You may remember that I have previously posted on the little accessories we have for our drinking round the campfire and these are very lovely for when I do not have my little wine glass table. 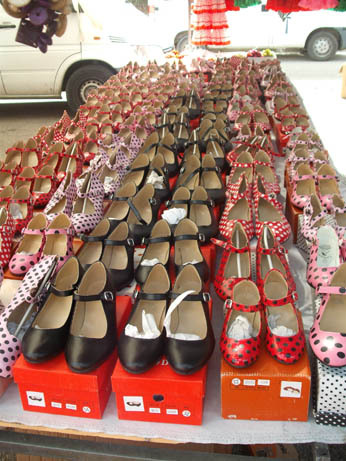 She bought them while on holiday earlier on in the summer, sorry I do not know where from. Here is Ellie modelling them for me while pouring me a little pre-mixed G and T on Friday night while getting ready to have a BBQ. 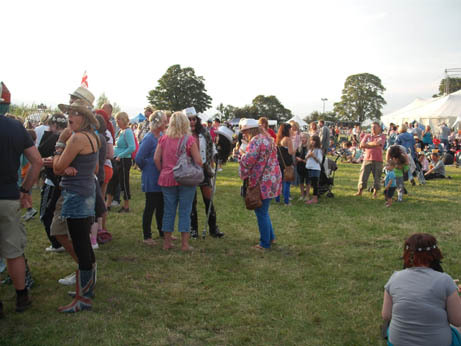 As befits a sophisticated festival there were lots of lovely outfits and some wonderful fancy dress – one of my faves was the Alice Cooper lookalike on Friday night – you can just see him in the middle of this pic, complete with plastic snake! I am just about to buy a new tent for next year on the grounds that they are all reduced at the moment, the one we have had for the last 3 years, a Vango Tamor 500, has been great but is starting to show signs of wear and there are a couple of split poles that we have had to patch so we are going to keep that as a reserve, festival tent that kids can use (as in I don’t mind if it comes back even worse for wear) and get another Vango, this time the Icarus 500 which is an updated version. These are great tents for us as they are light weight for taking on the train, sleep 5 so plenty of room for us and all our kit and also have really good bedroom heights so that we can hang our re-enactment clothes up and get dressed in comfort. 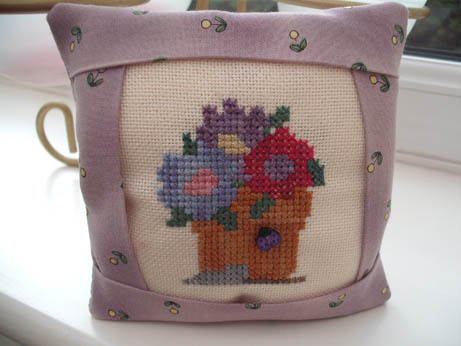 I managed to get a good pic of the Seasonal exchange I got when I came back from Spain which was this lovely flower pillow from Lynn. I have put some ribbon on it so that I can hang it with the others in the dining room. Have not got any other finishes to show – things have been very slow around here what with all the being away and we are away again this weekend at Bolsover Castle for our last re-enactment show of the year. Hope you all have a lovely week and I will be back again next week with hopefully more pics of sunny camping! I have noticed this Smilebox slide tool on a few blogs recently so have been having a little play this evening with some of my flower pics – enjoy! Hello there and I hope that you are all well and happy. We have just got back home from a very lovely day out – my very first trip to the Birmingham Quilt Show which was very good. I went on a coach trip with Ellie and my quilt group and when I have sorted out the pics will post them. I was very restrained and stuck to my shopping list of practical items to finish existing projects plus a very small bit of Xmas fabric (well you have to don’t you – it all needs a good home and I will probably be in China in November when the Harrogate show is on so have to stock up 😉 ). We have been in Spain all week, lucky us, enjoying very hot weather which meant that little could be done except go to the pool or beach, read and stitch on the terrace. I have nearly completed another little stitched Xmas ornie for me (very appropriate stitching when it is 36 degrees outside!) 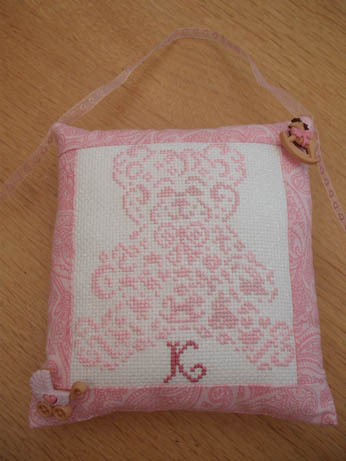 and have been working on a baby gift as well. We did of course see the family including the recipient of our handmade gifts who I am pleased to say really liked them. 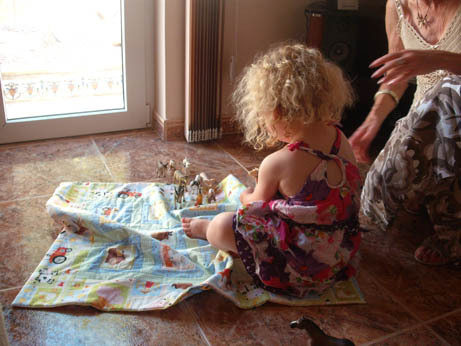 Here is Anna-Mae with the cat that Ellen made her and playing with her farm quilt. 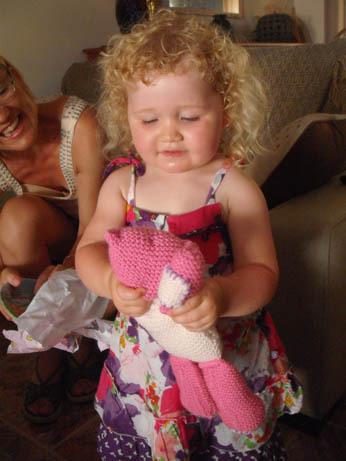 She is so gorgeous and was a delight to watch playing with the animals and helping ‘Great Nana’ open her presents from us as well. 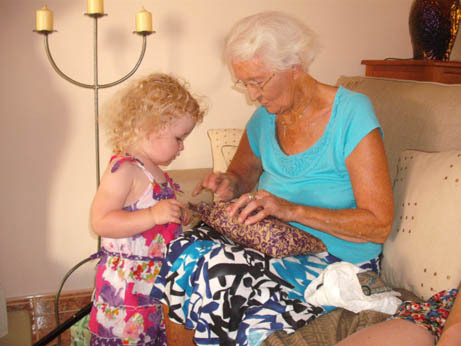 Nana was 99 a few weeks ago and is looking forward to her 100th birthday celebrations as she just had a little party this time! 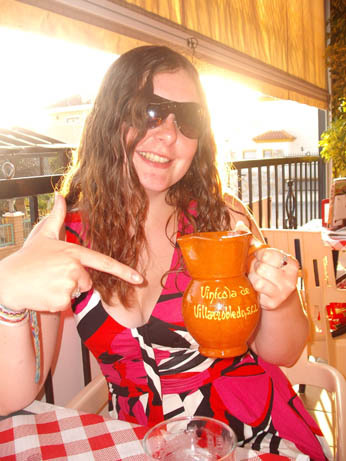 We also went out for some very nice meals including a Spanish restaurant near our house which we had not tried before that had a very good ‘menu del dia’, 3 lovely courses including a half bottle of wine for 10 euros – Ellie was very impressed with the wine carafe! 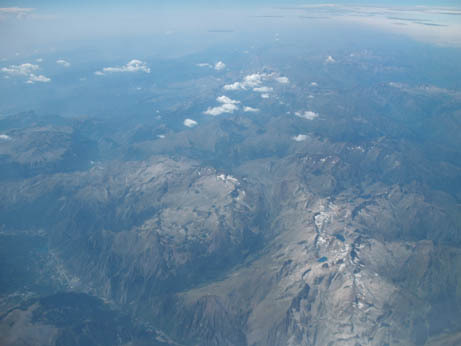 The flight back was brilliant, there were clear skies till halfway across France which meant I had some wonderful views and was able to get some very nice pics for the Scavenger Hunt which I will post at the end of the month. 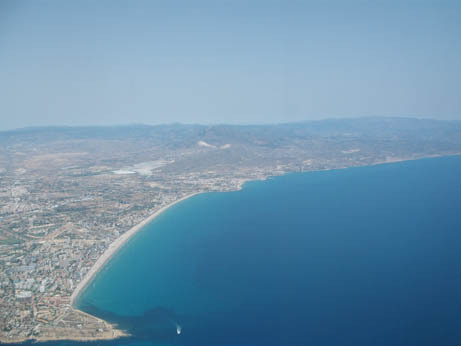 Here is the view as we left Alicante. 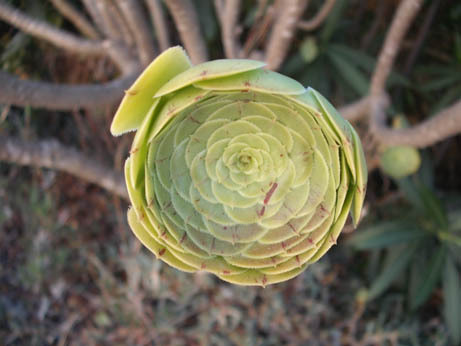 And of course it wouldn’t be one of my Spain posts without a cactus pic now would it! This is variety I have not seen before which looked like little cabbages on stalks. 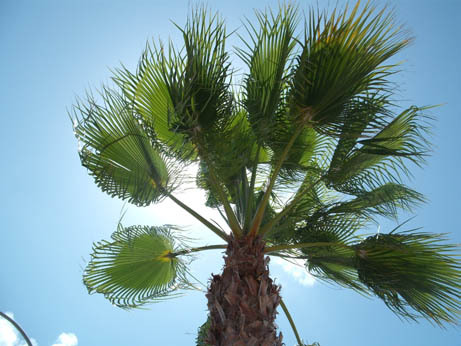 And this is a palm tree waving in the wind as we waited for the bus to the beach. While we were away my Summer Exchange partner got her stitched piece from me and I had a lovely little pillow from my partner in the US. 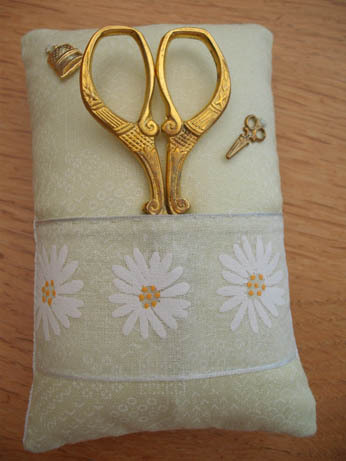 I have not had any good light yet to take a pic of the pillow but here is the pin and scissor keep I sent to Gaby in Germany. 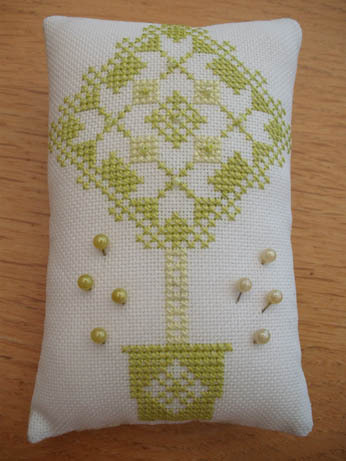 This is a freebie design from The Workbasket website called Quaker Tree which I have stitched before – again done on sparkly evenweave with Silk Mill thread. The backing fabric I bought from one of the women at quilt group who has a fabric shop and I had the ribbon already in my stash, the ribbon is stitched on to the top of the little pocket that holds the scissors. Charms as before from Stitch Direct. Well I have a nice quiet week ahead so I am looking forward to some finishing off of stitched items including the large pile of Xmas ornie hearts I have on my coffee table! We are away next weekend and the following one so I am making the most of this time. Hope you are having a nice time wherever you are. Thank you for visiting.